The gallery at Fire Glass Studio is celebrating bright and bold colors of summer, featuring a wide variety of one-of-a-kind handcrafted light-filled glass sculptures, bowls and artifacts created by students and local artists. Hasson, 50, a former Israeli soldier and now artist/entrepreneur working in Canoga Park, recently opened Fire Glass Studio, a place where adults, children and families produce dazzlingly beautiful glass fusion art. “The painter Marc Chagall, one of my favorite artists, used stained glass art to express new beauty and his faith. I think glass art can be so life-affirming,” she says. 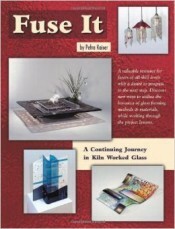 Her passion about the healing power of fused glass art is evident. Her eyes sparkle when telling a visitor how the technical skills learned and the inspiration experienced are invaluable to a child, a senior, or anyone who needs a sense of accomplishment. 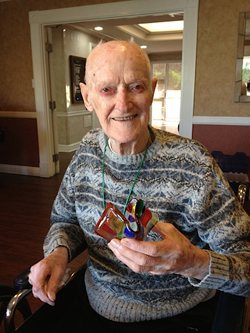 Garden Crest resident proudly displays fused-glass project. “Once a month, I drive down to Silver Lake to teach elderly residents at the Garden Crest Rehabilitation Center, and there’s no doubt in my mind that making fused glass art brings connections and meaning to their lives,” she says. With an M.B.A. from University of Judaism, Michal, also a wife and mother of three, has her own reasons for mastering an art form. She talks about the time a serious illness, only a few years ago, caused her to step away from a successful career in business. Largely self-taught, Hasson quickly gained an expertise in using glassmaking techniques and tools. 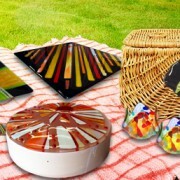 The glass fusing process is a delicate mix of old- and new school methods. The skills are traditional ones: using a fusing kiln, molding or flat-fusing glass items, and applying paint to glass with varying colors. But the design work can be cutting-edge, taking digital stencils or models to produce a unique-shaped bowl or jewelry piece. Fire Glass Studio held an Open House to celebrate its one-year anniversary. Fire Glass Studio offers glass fusing art classes and workshops to children and youth, families, and adults. Owner Michal Hasson said she was delighted for the opportunity to introduce a creative and enjoyable art form to communities throughout the San Fernando Valley. The Open House featured gallery exhibits from glass art students and several independent glass artists, who use the studio space to enhance their art projects. In attendance were prominent glass artists, but also a number of visitors who had just discovered Fire Glass Studio. According to Hasson, guests were thrilled to discover the variety and quality of the colorful artworks on display, and, as an added bonus, they were given a chance to try their hand at creating their own one-of-a-kind fused glass art. Even some curiosity seekers found themselves at a craft table learning how to combine different shapes and colors of glass to make their own eye-pleasing keep-sakes. Fire Glass Studio’s in-house artist and head of teaching, Darren Frale stated, “It is so much fun to see someone try their hand at glass fusioning for the first time. Watching someone go from ‘I could never do that’ to ‘I can’t wait to do it again’ makes what I do so worthwhile. Frale, who is a graduate of the Corning Museum of Glass as well as the famous Glass Furnace studios and a contributor at Santa Monica college’s Glass Art program, is an avid glass artist, who loves sharing his skill and passion with the student’s at the studio. https://fireglassstudio.com/wp-content/uploads/2014/06/fire-glass-studio-open-house-2014.jpg 257 715 Rachel Aladdin http://fireglassstudio.com/wp-content/uploads/2013/04/fire-glass-studio-logo.jpg Rachel Aladdin2014-06-07 00:09:072017-11-14 06:22:04Fire Glass Studio Celebrates Its First Year In Business. the history and possibilities in Fused-Glass Art. the many different types of techniques used to create Glass Art. how to work with ceramics and acrylic paints to enhance their Glass Art. how to work with artist tools such as brushes, saws, grinders, kilns and polishers. how to combine paint, wood, glass and other media into works of art. how to take their “Creative Vision” from their imagination, to paper, and then create stunning one-of-a-kind art they can treasure forever. The camp is designed for kids age 6 to 16 and the cost is only $390.00 for the entire two-week session and includes all supplies and materials. If you sign up now and use the promo code “glassadventure” at checkout, you can receive an additional 10% discount. Don’t miss this chance to let your kids explore their un-discovered creativity in this exciting adventure. Local Visual Art Studio Fire Glass Studio proudly shares the work of Ruth Sussman, a local Glass Artist who uses her art to inspire others to let go of their pain and to always remember those who were lost. As a young girl, Ruth learned of that dark chapter in our history when more that 6 million people were exploited and murdered simply because of their cultural heritage. Even though Ruth and her family were not direct victims of the horrors of that time, Ruth feels deeply moved by that period and began to create Glass-Art that would help her express the deep feelings she feels when she thinks on that time. In remembrance of the Shoah, Ruth created a striking and powerful piece of fused-glass wall art (see photos below). In it, she captured its darkness and pain as well as its humbling message. Michal understands the pain of the Holocaust Survivors too well. In 1940 Michal’s grandmother was killed by the Nazis and her mother Devora Finkelstein and her family barely escaped the same fate when they evaded German troops by running into a nearby forest where they became part of the partisan resistance movement in Poland until the war ended. This is why Ruth’s efforts hold so much meaning. Michal says that Ruth began working with Glass Art almost ten years ago with Mosaic Glass. She then discovered the variety and depth of expression she could bring out in her work when she began to study Glass Fusioning. In the last year, Ruth has become a constant fixture at Fire Glass Studio in their Open Lab Program which allows independent Glass Artists in the LA and San Fernando Valley area to come and create their art in a professional fully equipped studio at their own pace and desire. Ruth has a tremendous passion for her art. She loves the fluidity and tactile connection to molding glass into real world extensions of her feelings and imagination and seeing the results each morning when she opens the lid of the kiln used to fire her glass into its final shape. To commemorate Holocaust Remembrance Day, which begins at sunset, Sunday, April 27, and ends Monday evening, April 28, Michal is opening her studio to allow any local Glass Artists who would like to come and share their work, see some more of Ruth’s art, or to get together to speak on how the power of art can help create real change. 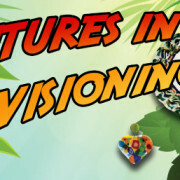 Fire Glass Studio, the premiere location for residents in the San Fernando Valley and Los Angeles area to learn the exciting visual arts process of Glass Art Creation, has released their spring 2014 schedule. The Studio which opened in 2010 has been enjoying growing success and an ever-increasing fan base of dedicated students as well a usage by local professional and independent artists who use the studio’s professional environment to develop their own artwork. Fire Glass Studio offers a full array of classes for both kids and adults. Classes are available for beginners, advanced students and those looking to refine their talents into higher levels of Glas Art creation. The classes tend to fill up quick so be sure and reserve your space today. The studio is offering a companion discount of 10% discount off when you bring a friend. Prices include complete instruction, access to our complete facility, all materials and tool s required to participate. All you bring is a sense of discovery and an expectation of fun and Fire Glass Studio provides the rest. In this fun and technical workshop you will be introduced to kiln formed glass through a variety of projects- full fusing layers of glass, tack fusing and more. You will learn the basics of how to cut, fuse and slump (shape) glasses, and make beautiful fused glass projects. The objective of this class is a solid foundation on kilnformed glass so that you’ll be able to begin working on your own with these techniques on class consensus. Glass, materials and all necessary tools are provided; just bring your ideas and creativity! This workshop Designed for those who wish to cover all the basics of kilnforming in two intensive days. Learn glass cutting, fusing, slumping, glass compatibility, firing schedules, and more. When you leave, you’ll know everything you need to know to get started fusing glass. and combining crackle with metals. In addition to discussing firing schedules, we’ll also cover such variations as creating matte finishes and creating both raised and flat crackle surfaces. More crackle in two days than most courses teach in a week! . Familiarity with glass cutting and with basic fusing and slumping techniques is recommended, but not essential. All materials will be provided. Learn how to create one-of-a-kind designs by making pattern bars. A pattern bar is a thick bundle of glass that has been fused together to form a solid mass. The size of pattern bars can vary, but most are one or two inches by about an inch and several inches long. When formed, these bars can be cut into slices with a glass saw, lapidary saw, or trim saw and then re-fused to make unique items. In this 2-day workshop everyone will walk away with their own hand-crafted pattern bar . All materials and tools are supplied for this workshop. Expand your children’s world beyond crayons and markers. Each project will bring a new adventure in creativity and imagination. Children will make expressive glass art objects including, but not limited to, Tea Light holder, picture frame, wall art , sun catcher and many more. This is about having fun an creating art projects all at the same time! For those who want to go beyond what they learned in school, or for those Glass Artists who are looking for a pristine, fully-equipped studio in which to practice their craft, Fire Glass Studio provides “Open-Space” access to our complete studio facilities to make your own glass artwork. The open lab is for completing your projects and be able to work in a self-paced, supportive and creative environment. Teaching staff will assist you with ideas, motivation, suggestion and techniques. The studio will provide you with tools and some limited martial (some frit and stringer) and will fire your projects at no additional cost. Firing is limited to one project per session. The Fire Glass Studio is a great place to hold your next birthday party, corporate team building event, bridal or baby shower and or private party. Our private Party Room which holds up to 16 people is available. Choose from a variety of craft activities including pottery painting, beading, mosaics, glass fusing, wheel throwing, wax hands or create-a-bear. and more.The use of the studio for 2 hours. All materials and firing time to complete one glass project is included. We do the set-up and clean-up! We provide Party Decorations or will help you with yours. You are welcome to bring in food. We have a refrigerator, microwave, and cold/hot water. Prices vary from $26- $50.00 per person depending on the project selected. 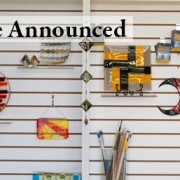 In addition to our regularly scheduled workshops, classes and “Open Studio” space offerings. Fire Glass Studio continues to expands it outreach into the community through several different opportunities for individuals and groups to bring the fun and exciting Visual Art medium of Glass Art to their next big event or to create specialized on-site programs for your business or organization. Whether you and a few friends are looking for something exciting to try out, someone trying to think of a unique place to have a special event party or a hospital, school or other non-profit who thinks our Glass Arts Education program might be of benefit to those you serve, give us a call and see how Fire Glass Studio can help. Our team is ready to help “design” the perfect program for you and your group. Customized educational and training programs for special needs groups. To learn more or to enroll in any of our classes or workshops, click on any of the enroll links above or browse our offerings here. In December of 2013 Fire Glass Studio joined with Garden Crest Crest Rehabilitation Center to provide an ongoing series of in-facility Glass Fusion Workshops for their permanent senior adult residents. Garden Crest is located in the Silver Lake section of Los Angeles, and has a magnificent view of the Griffith Park Observatory and the Hollywood Hill. The center provides rehabilitation services, recreation therapy and various social services. 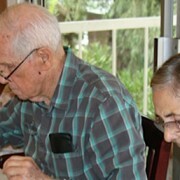 In addition they are home to more than 100 permanent senior residents for which they provide complete independent living as well as assisted living services. As part of their growing program of providing their permanent residents quality standard of life services, Garden Crest is continuously looking to expand their ability to provide life-enhancement services in order to help keep their residents active and involved in a thriving and caring community. Said Limor Ness, Garden Crest’s Director of Recreation Services, “Older adults are supported through the recreational and activity programs we offer. We encourage them to respond and interact with their environment and each other in order to help build self-esteem, personal value and a sense of community with their fellow residents. This is done through the presentation of a variety of activities which promotes complete sensory involvement such as sights, sounds, smells, tastes and tactile interaction with objects”. As part of this growth, Limor contacted Fire Glass Studio’s owner Michal Hasson to see if she could provide a in-facility workshop geared to seniors that might be of benefit in Garden Crest’s goal to help keep their residents active and involved. Michal immediately saw the opportunity to be of value and set about creating a specialized program to meet Garden Crest’s need. From Day 1, the workshops have been a great success. One project that made the residents feel especially proud is a huge collage of twelve paintings framed into one large wall art which decorates the lobby of the center. “I wanted to create a project that will glow the lobby with happy colors, and at the same time will incorporate everyone participation, creativity and imagination.” said Michal Hasson about the piece. 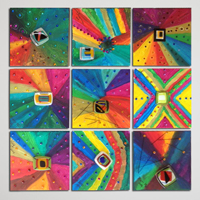 This distinctive wall art is a collage of twelve individual acrylic painting which required a few separate stages to accomplish including painting on canvases, using acrylic paint, cutting layers of glasses that was fused and glue onto the canvas and the gluing of colorful Swarovski stone to the paint. 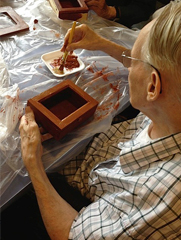 At every stage the residents participated in creating the final work which required them to practice fine motor skills, sensory, creativity and reminiscing. Both Ms. Ness and Ms. Hasson are very proud of the results of the workshops and plan on continuing the program indefinitely. Scott Adams, the creator of Dilbert, once said “Creativity is allowing yourself to make mistakes. Art is knowing which ones to keep.” Thanks goodness the people who first found a way to soften and mold glass as an art form, decided it was worth while enough to chronicle and pass onto following generations so that even today, thousands of people are still able to discover their creative ability through this beautiful and fulfilling Visual Art form. No one knows exactly where Glass Fusion began, but it is suspected to have originated somewhere between the 3rd and 2nd century B.C. Of course, natural glass fusion is as old as time itself in that nature has been creating “glass art” ever since the first lightning bolt hit a piece of sand. The resulting instantaneous melting of the silica into irregular hollow glass tubes has long fascinated scientists and artists alike. Depending on the composite materials in the sand, Fulgarites as they are commonly called, can be formed in a variety of colors, sizes and shapes. Man-made glass for utilitarian as well as Glass Art is thought to have emerged from the Mesopotamian and Egyptian cultures as far back as 3500 B.C. and quickly spread to Africa and the middle-eastern societies of the time. In time it spread to Asia and the central European societies. Early glass work consisted of various processes of taking crushed silica or quartz along with various other aklalis like calcium lime and adding naturally occurring coloring agents and binding agents and then molding, modeling or sculpting the compound under various heating and cooling methods to create bowls, plates, jewelry and other household and later creative works of art. 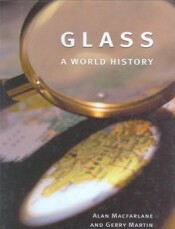 True glass fusion, which is the heating and shaping of separate pieces of glass under temperatures ranging from 1000 to 1500 degrees, is thought to have originated by Phoenician sailors who discovered the process by chance when looking at what happened to glass shards and broken glass plates when tossed into their seaside fires after a night of cooking and keeping warm. Interestingly enough, the area in which the Phoenicians culture flourished is also the seat where modern-day Lebanon now exists and which back in the time was one of the most important glass making centers for the modern world. As objects made from glass became more and more popular both from a utilitarian standpoint of its strength and light weight, to its ability to be formed into beautiful shapes and colors, so did the artistry of the techniques used in creating these object become more and more refined. Glass fusion became a highly specialized field of craft for many tradesmen from creating everyday objects such as bowls, plates and jugs, to much prized jewelry like glass beads, to even Egyptian shipwrights who used the technique to create glass “skins” for the vessels. 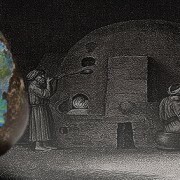 Even though glass fusion was highly popular in the early first century B.C., it soon found itself fading as an industrial technique when the art of glass blowing became more specialized and was incorporated as a faster production method instead of the glass fusion process. Thank goodness artisans kept the art alive throughout the ensuing centuries. Although glass fusion experienced a minor comeback during the Renaissance period, it wasn’t until the mid-20th century in the US that the art of glass fusion began to see a serious re-emergence as an art form. Today, Glass Art, and specifically glass fusion, is more popular than ever, with museums around the world displaying beautiful creations by such well-known glass artists as Richard LaLonde, Ruth Brockmann and Henner Schroder. In addition the growth of Glass Fusion art as a hobby and expressive art medium for the general public to participate in has never been higher. With modern firing equipment, specialized glass materials created specifically for fusing and the ease in which anyone can learn how to create truly spectacular art work with some simple training, Glass Fusion artistry is a flourishing industry.